by Max De Pree. Eerdmans Publishing Co., 2001. 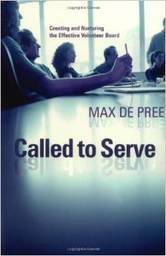 Readers enter into Max De Pree’s personal communication in this short, valuable resource. With letter-writing as the format, De Pree uses his vast business and non-profit board experience to discuss the characteristics and structure of an effective board, consider its responsibilities individually and collectively to an organization and its president, explore board structure, and reflect on common problems and conflict. The longest section focuses on the eleven “marks” of an effective board. This includes assessment, mission, gratitude, planning, and the critical importance of relationships. Individual and collective leadership roles and responsibilities are explored. Specific topics are commitment to the organization, hospitality, community, boundaries, and communication. A unique feature is the chapter titled “What the Board owes the President.” The four attitudes and behaviors identified and explained are “mandate, trust, space, [and] care.” This secular resource is useful for all congregations who want to evaluate and/or improve their Board’s effectiveness.